Beach Villa 3 is architect designed for the tropics and recently renovated in a small complex of six villas. With only a rainforest reserve between you and beautiful Four Mile Beach, lie in bed and listen to the sea and the rainforest - all within an easy walk to the Port Douglas village centre. Enjoying security and privacy, the villa is also wonderfully light and airy featuring vaulted ceilings and sliding glass doors. The ground floor has two bedrooms (1 x king or 2 x singles & 1 x twin) plus a bathroom, separate toilet and laundry. An open-plan living room, indoor dining and gourmet kitchen opens out to a private sunny deck with your own heated saltwater swimming pool. Relaxed outdoor dining on the poolside deck is even more inviting with the great open kitchen servery and gas Weber BBQ. Upstairs is dedicated to the large master bedroom with a private balcony overlooking the pool and rainforest reserve, plus walk-in-robe and ensuite bathroom with a double shower. With just a two minute stroll to the beach (without crossing a street) and a pleasant 10 minute walk to Macrossan Street, the living is easy at Beach Villa 3. Spend your saved car-hire dollars dining out at the many fabulous Port Douglas restaurants. toilet, shower, Large ensuite bathroom with twin showers. toilet, shower, Shared bathroom for ground floor guests. Separate toilet. The ensuite bathroom services the master bedroom. There are twin showers and single toilet. This is a very large comfortable space. The second bathroom services the downstairs bedrooms. The toilet is separate to the bathroom on this level. The property backs onto the foreshore reserve of Four Mile beach. The beach is approximately 200 meters from the property and is easily accessible via either of two walking tracks. Split systems in all bedrooms and living area. All bed linen, bath towels and beach towels provided. One car garage plus carport for additional small car. Nescafe Pod coffee maker, also coffee plunger. Compatible with iPhone music jack. Upstairs balcony off master bedroom. Deck surrounding outdoor pool. Undercover area for outdoor dining. A beautiful home with everything you will need for a lovely trip away. We have been so impressed with this place. Great location, clean, amazing pool, air conditioning perfect, luxurious..... the list goes on. The owners have been very helpful as well. You will not be disappointed. The home was outstanding from top to bottom. We enjoyed our stay very much, the unit shows better in person than the pics. We had a great stay there and the Port Douglas area. Loved the location- 10 min walk from center. Beautiful house and lovely dipping pool to keep cool. We have just left Port Douglas and we so want to go back! 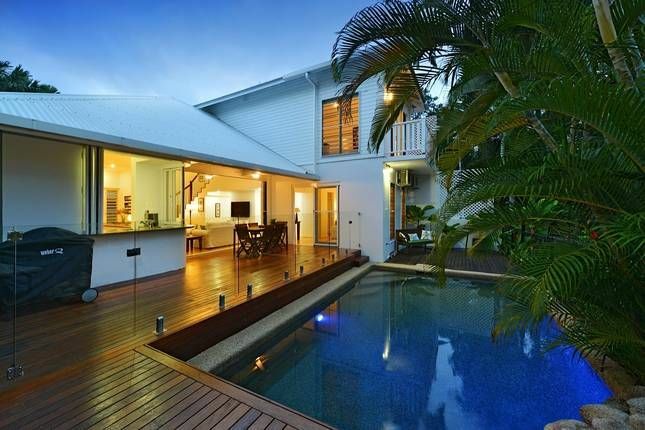 This villa is located in close proximity to the beach and the town of Port Douglas. The villa itself is very comfortable, furnished beautifully and the pool is a perfect temperature to cool off any time of the day. Communication prior to our arrival and once we were there was great, Anthea was lovely to deal with. Her home is very well set up, we couldn’t fault the cleanliness and it had everything we needed and more. Having looked at a couple of properties whilst we were on Port Douglas, we were very pleased with our decision to choose Anthea’s. Thanks Anthea, we’ll be back! Wonderful, modern 3 bedroom and pool modern townhouse! Short walk to the beach, lovely outdoor verandah, pool and deck. We really loved our stay in this well appointed and comfortable holiday townhouse! Hope to come back, thanks for everything. Thanks Kerrie and Dave. So glad you enjoyed your stay at Beachvilla 3. Hope you come back and stay soon! Everything was perfect, the house and pool were perfect, every room air conditioned, ceiling fans throughout, a short 10-15 minute walk to all in town, even the little things like, bottle stoppers, (very important my wife said), everything you need and more is on hand.